One of the few pieces of statistical evidence that we can look toward at this early stage of the presidential campaign is the number of media hits that each candidate is receiving. Apart from being interesting unto itself, it’s plausible that this metric has some predictive power. At this point in 2007, Barack Obama and John McCain were receiving the most coverage among the Democratic and Republican candidates respectively, and both won their races despite initially lagging in the polls. In contrast to four years ago, however, when the relative amount of media coverage was fairly steady throughout the campaign, there have already been some dramatic shifts this year. Sarah Palin’s potential candidacy, for instance, is only receiving about one-fifth as much attention as it did several months ago. The idea is to identify cases in which a candidate was the main focus of the article (as opposed to being mentioned in passing) and when the article was about the presidential campaign itself (as opposed to, say, Mr. Trump’s reality show). The technique isn’t perfect — there are always going to be a few “false positives” from out-of-context hits — but it ought to be a reasonably good benchmark for the amount of press attention that each candidate is getting. The search includes all sources on NewsLibrary.com — a combination of about 4,000 newspapers, blogs and television and radio stations — other than press releases, which I’ve excluded. I’ve tracked citations for the 23 Republican candidates who have been mentioned in at least one poll since the midterm elections in November. During the month of November 2010, Ms. Palin’s name retrieved 777 hits, according to this technique. That represented just over half of the 1,533 citations for all 23 candidates combined. So far this month, however, Ms. Palin has accounted for just 124 hits out of 1,090 total, or roughly 11 percent. Instead, her place has been taken by Mr. Trump, who has accounted for about 40 percent of the coverage. The decline in media coverage for Ms. Palin tracks with a decline in her polling numbers. Whereas she was pulling between 15 and 20 percent of the Republican primary vote in polls conducted several months ago, she’s down to about 10 percent in most surveys now. Mr. Trump, meanwhile, whose media coverage has increased exponentially, has surged in the polls, and is essentially in a three-way tie for the lead with Mitt Romney and Mike Huckabee over an average of recent surveys. 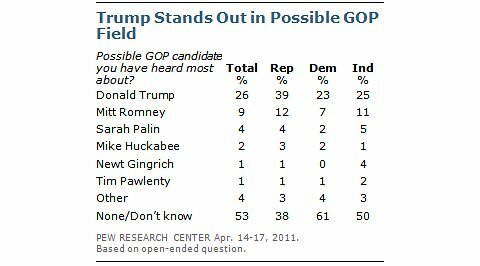 A Pew poll released yesterday, which asked voters which Republican candidate they’d heard the most about, found Mr. Trump’s name mentioned far more often than any other. The voters in Pew’s survey passed this quiz with flying colors: so far this month, Mr. Trump has in fact received as much coverage as the next six candidates combined. I would stop short of concluding, however, as The Washington Post’s Greg Sargent suggested yesterday, that Mr. Trump’s candidacy is entirely a media creation. 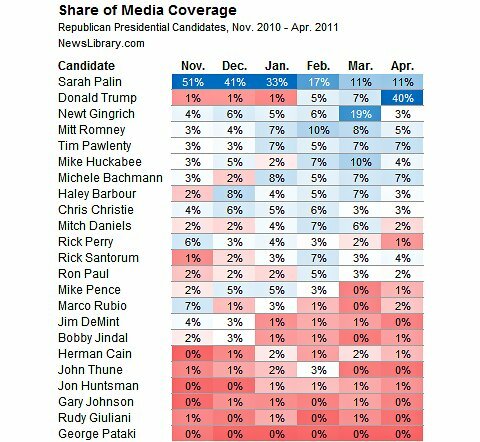 Other candidates have had periods of heavy coverage — for instance, Newt Gingrich received more coverage than any other candidate last month — without moving up in the polls. And Ms. Palin was never able to parlay her disproportionate coverage into being the first choice of more than about 20 percent of Republican voters. That is not to say that media coverage doesn’t play any role. Mr. Trump is a master at getting attention, and there now seems to be a sort of feedback loop in which the more coverage Mr. Trump gets, the more he moves up in the polls, and vice versa. As to why Mr. Trump has surged when other candidates haven’t, I’m mostly agreed with David Frum’s thesis: he’s run as a populist, and that’s something that suits the mood of Republican primary voters. Mr. Trump — who may be as skilled an entertainer as he is a businessman — has been surprisingly adept at playing the part, in contrast to some other candidates whose efforts have fallen a little flat. But there is something more here too: voters do not like being told what to do. While they may well consider factors like “electability,” they need time to come to those conclusions on their own, rather than being given a list of “serious” candidates from Washington columnists. Mr. Trump clearly has some vulnerabilities — his negatives are much higher within his own party than those of his counterparts — but a great number of Republican voters are dissatisfied with with their choices, and he may represent something of a protest vote against the choices the Republican establishment deems to be acceptable. As for Ms. Palin, her decline in media coverage may not be much of a problem unto itself. If anything — given how negative some of the attention had become — it may help her to lay a little low for the time being. But if she is serious about running for president in 2012 — something that the conventional wisdom is now betting against — she probably needs to take some concrete steps toward doing so. Now that there is an actual primary getting under way, and it includes other “interesting” candidates like Mr. Trump and Michele Bachmann, she can’t count on coverage by virtue of her personality alone.